It is one thing to add curb appeal that can be enjoyed during the day, but it is a completely different thing to make that curb appeal pop at night! This time of year people enjoy the extra glow from the festive Christmas lights that are around, but what about making your house glow year round? It is possible with outdoor lighting. Perhaps you’ve never considered outdoor lighting, but let’s review the top three reasons that we recommend adding beautiful outdoor lighting to your landscape! There are many things that make houses or other structures beautiful in and of themselves. For instance, we’ve worked with customers that want to highlight the craftsman-style features of their homes. And with beautiful features such as square columns, shake siding, stone accents, and window boxes, who wouldn’t want to highlight their home? Adding outdoor lighting to steps, walkways, and even illuminating the woodline in the backyard helps to add an extra sense of safety to your Woodstock, GA home. When walking your property or yard after dark you will be that much more sure of your footing and won’t have to worry about tripping on uneven ground. 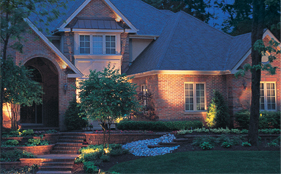 While adding extra lighting can help with your personal safety while walking, it can also add to the security of your property and safety from potential intruders. Your home becomes a less likely target when the cover of darkness is eliminated. Contact our Woodstock landscaping design office today at 770-924-1001 for more details regarding our landscaping lighting and illumination options!